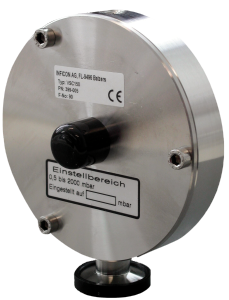 The INFICON Vacuum Switch VSC150 is a absolute pressure switch with a adjustable electrical switching contact from 0.5 to 2000 mbar. The mechanical design allows a short therm overload of 3000 mbar without any impairing the switching accuracy of ± 0.1 mbar. INFICON offers customer specific adjustment of pressure switch.